Something a little different on the blog today, as we've been having quite a lot of nice weather recently *touch wood* I thought I would feature a little recipe that I tried out for a zesty breakfast treat! 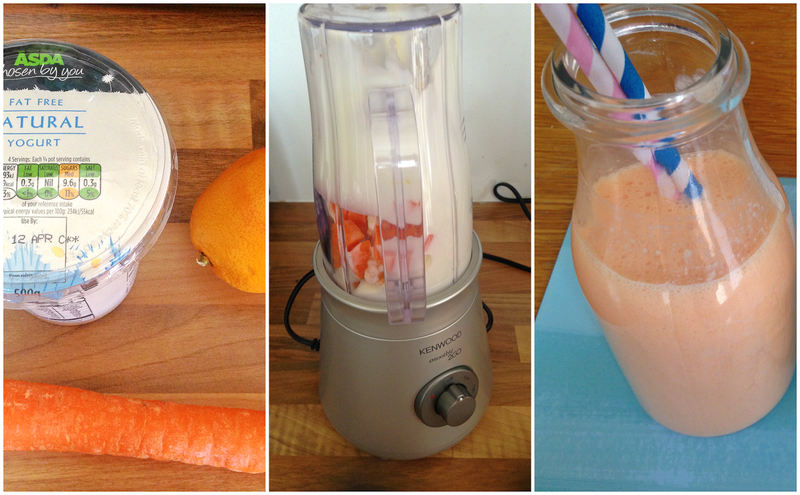 Recently I was offered the chance to review the Kenwood Smoothie 2GO, and share a recipe which I made in it. The Kenwood Smoothie Maker 2 Go, is like a normal smoothie maker with a twist, the twist being that once the smoothie is complete you take off the blend and can swap the blade for a lid and it's ready to go, as simple as that. Which is such a creative idea for those who drink them on the go or don't have time to faff around with different glasses. I decided to put mine in a milk bottle as I had previously been to Ikea and purchased some and needed a use for them and my quirky straws! Step 2: Peel the orange and separate then cut into smaller pieces. Step 3: Place both in the blender and then add a tub of fat free yogurt. Step 5: Turn the Blender on, it took me 2 minutes to create this, but dependent on what you use it can take different amounts of time. The less bits you want within your smoothie, blast it for longer. Step 6: Unscrew the blender, take the blade off and replace with lid and you're ready to go! Step 7: Enjoy the Zesty goodness! The flavours in this sound incredible. Will have to give this one a go.